This week is a big one in lunar exploration: the public will be formally introduced to the complete roster entrepreneurial leaders of this new era. You'll have to wait until Thursday to get all the details, but for now I can already say that there are many more of them that we ever dared hope. It has been wonderful and inspiring for us to watch as groups of brilliant and ambitious innovators from all over the world have come out of the woodwork to declare their dedication to opening access to the Moon for a new generation of scientists, explorers, and engineers. This announcement comes on the heels of a very significant milestone that's probably less glamorous: the finalization of the Google Lunar X PRIZE rules set. As our teams can no doubt tell you, this has been a long and arduous process. Essentially, think of a complex contract negotiation about a very unique, high visibility project, then add in 20+ signatories based in a large number of countries with a large range of legal norms, then stretch that process out over three and a half years, and you begin to get an idea of what finalizing this document took. Still, we at the X PRIZE Foundation and all of the teams that have signed up to compete for this prize are not exactly shy about tackling difficult tasks; so we threw ourselves at this one with gusto. Over the past few years, our teams have been very direct but very respectful about pointing out areas for improvement in the competition rules. As a consequence, I think we have created a strong rule set that will help ensure that this prize leads to a lasting change in how we explore our universe. When we sent this document out for signature by our competing teams, we knew that it would be a natural part of the process to lose teams: some teams might not like the final requirements, and others might not feel they can be competitive given the large and imposing pool of other applicants. However, this was not the case: although I won't spoil the surprise, suffice it to say that we are extremely pleased with the rate of retention of old teams--just as pleased as we are with the intake of new teams just before the registration deadline, in fact. So, we are at a point where we can say we are ending one part of a journey and starting another. We have got an absolutely stellar roster of teams (no pun intended). We have seen one team publicly announce a signed launch contract, with many other extremely excited developments happening in private. We have seen the world's premiere civil space agency step forward and become a willing customer of the teams. This first phase of our journey was a success. The next phase will be about building on this momentum. For our teams, this will mean raising additional funds, iterating their designs, and signing up more customers. For us at the X PRIZE Foundation and for our friends at Google, this will mean educating and inspiring more people all around the world, and helping our teams as best as we ethically can to ensure not only that someone wins, but that their victory and the valiant efforts of the other teams really do start an era of financially sustainable exploration. The journey ahead will be challenging, but will also be incredibly fulfilling - and incredibly fun. This week also marks the end of a journey and the start of another for me personally. This piece of news I share with considerable sadness, but also a great deal of excitement: after almost six years of working at the X PRIZE Foundation, the time has come for me to move on. As of the end of this week, I will be leaving my post as an employee of the X PRIZE Foundation and headed to a new position as the Vice President for Special Projects at Virgin Galactic. This transition is made much easier because I am so incredibly thrilled with the progress of the competition, and so confident that it will be a complete success. It also is much easier because the transition is so natural: at Virgin Galactic, I will be helping build on the dream of the Ansari X PRIZE by truly opening the space frontier. I am incredibly excited to be joining the spectacular team at Virgin Galactic, and I look forward to sharing more thoughts about that in the future. I consider it a great honor to have worked with such fantastic people these past 5+ years, and to have represented such a unique and important project to an amazing and wonderful audience. I’ll continue to consider myself a part of the Google Lunar X PRIZE “family” for as long as you’ll have me. But this week is not about me. It's about the teams, and about the efforts all of us are putting in to change the future of how our species explores. I hope you'll join me on Thursday in saluting this amazing group of men and women that are dedicating everything they have to make life in our amazing two-world system better. 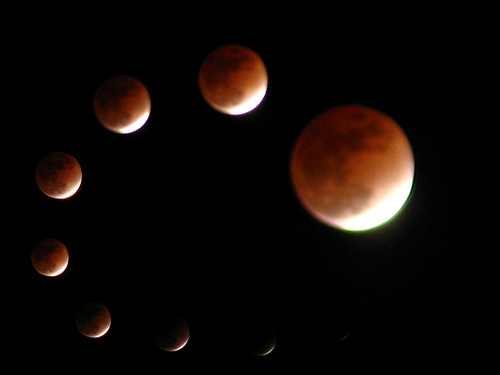 Photo Credit: "Lunar Eclipse, composite" by Flickr user SchultzLabs, used under a Creative Commons license.